AltFuels Mexico 2019 took place last week, on 11-14 March at the WTC in Mexico City, and several announcements related to the natural gas and sustainable mobility industries were made under its framework, including the delivery of 100 Hyundai natural gas vehicles to the Mexican transportation and logistics company Traxión. 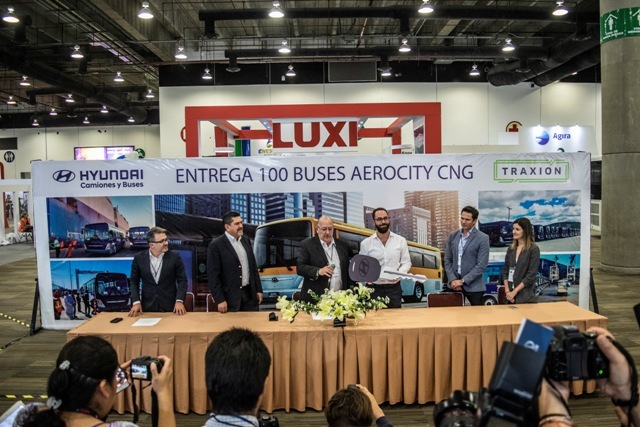 Traxión announced the investment of 350 million pesos (more than 18 million dollars) for the acquisition of 100 Hyundai Super Aero City CNG buses, which will help it transport over 9,200 workers daily. The acquisition of these 100 NGVs will also allow the company to strengthen its presence in the Pacific area, where it will add a total of 500 vehicles. With the new natural gas vehicles, Traxión operations will reduce emissions: 87% of CO and NMHC, 41% of NOx, and 85% of CH4, without forgetting that exhaust emissions and noise pollution will be reduced to 100%. The director of the passenger transport division of Traxión Elías Dana received from the CEO of Hyundai Mexico Gino Saer a symbolic key representing the delivery of the vehicles, which are equipped with anti-collision systems, advanced geolocation and artificial intelligence. “For Traxión, it has always been very important to remain an avant-garde company in all senses, which is why we are constantly exploring environmentally friendly technologies; thus, on this occasion we make one of the most important investments of the year to provide passenger transport service to the Hyundai plants located in Tijuana and Rosarito, through the use of natural gas buses,” explained Dana.